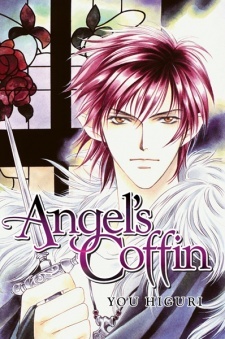 Tenshi no Hitsugi: Ave Maria was published in English as Angel's Coffin by Go! Comi on October 1, 2008. It has also been published in German by Carlsen as Grab Der Engel. I figured since there isn't a review for this yet, I'd just whip one up. Angel's Coffin is, to sum up in a word: ridiculous. Not because of craziness, but because the plot and characters are so hackneyed and dull placed in a rough "historical" setting. About the only things historical about it is the clothing and date! Sure it references historical events that happen during the time period, but the speech, the actions, everything all feel wrong. I haven't researched 1889 Vienna, however I highly doubt that people spoke like "hey babe." The story does not redeem any of the weak setting. It takes place in Vienna of 1889, and Marie is in love with the crowned Prince Rudolph. She knocks down a book, releasing Seto and the curse that he bring misery to the first one who sees him/he sees. He says he'll help her with her prince, but actually falls in love with her himself. (didn't see THAT coming) And so is our plot, neglecting all the little things like wars, betrayals, Vienna-reform and the demon who Seto is cursed by, that could have actually made it interesting. Characters were one-dimensional and boring. Seto fell into such a stereotype mold of an anti-hero it was almost painful. I'm fairly sure Marie was supposed to be endearing and romantic, but she was just a bubbleheaded immature hormone-crazy girl who I could not care less about, and still trying to find why Seto fell for her. Overall, it was an okay first read, it might have had a couple moments I don't remember at the moment. It was boring, predictable (even for me), shallow and poorly setting-set. I was really disappointed in this manga. When I read the back and the first few pages, I thought, "Hmm. A real historical setting with demons and gods thrown in? Interesting." It was NOT really interesting. Seto's falling in love with Marie was apparently supposed to go without saying (I really wouldn't have guessed he had if it weren't so predictable from the start), and so were her feelings for the prince. The characters were all really dull, and there wasn't much plot. Most importantly, it was very silly and immature, when I had thought by the setting that it would be slightly more serious and historically authentic. I prefer a touch of solemnity to something that's supposed to foreshadow a tragedy. It wasn't just silly, it was silly in a painfully cheesy, stupid way, and it was really, really boring. I don't think it's worth the time to read, and definitely not worth the money to buy. I feel that the plot fell flat. There was so much more that could have happened. Marie a baroness falls in love with Prince Rudolph. Marie is a goofy, cheerful, blundering character. She gives you a small smile. However her obsession with Rudolph turns my stomach, and makes her a one sided character. She's too busy with Rudolph to receive any real character depth. One day she manages to set free a god who has been imprisoned within a book. Seto the god who is released, ends up being released as a demon, under the control of Baphomet. Baphomet's only command is that he needs to make the person whom he releases him from the book suffer. However Seto is eternally greatful and instead ends up trying to help her receive happiness from Rudolph. Seto is a fantastic male character. However because the main character is so stuck only wanting one thing he doesn't get to do much. Overall the art is pretty... I liked the different clothes, it was a nice change. But I feel it was too stifled and the plot should have been more free flowing.